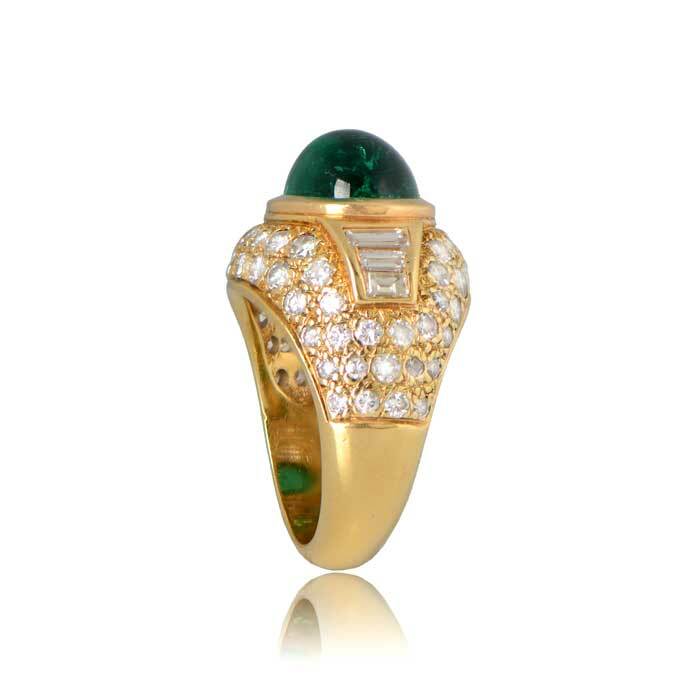 A bold vintage ring that centers a lively cabochon Colombian emerald with excellent color saturation weighing approximately 5 carats. Flanking the center stone are three baguette cut diamonds on each shoulder. The ring is decorated with prong-set diamonds. 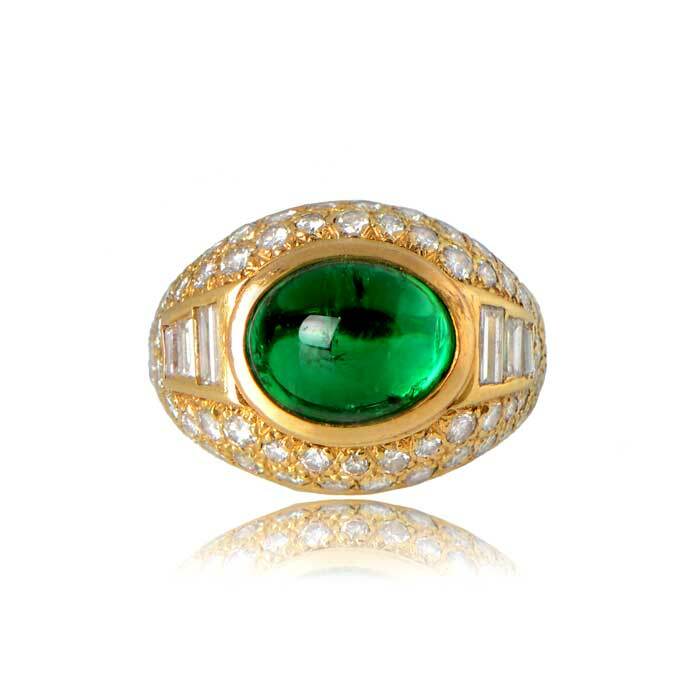 This ring is 18k yellow gold and is made in Italy, circa 1970. 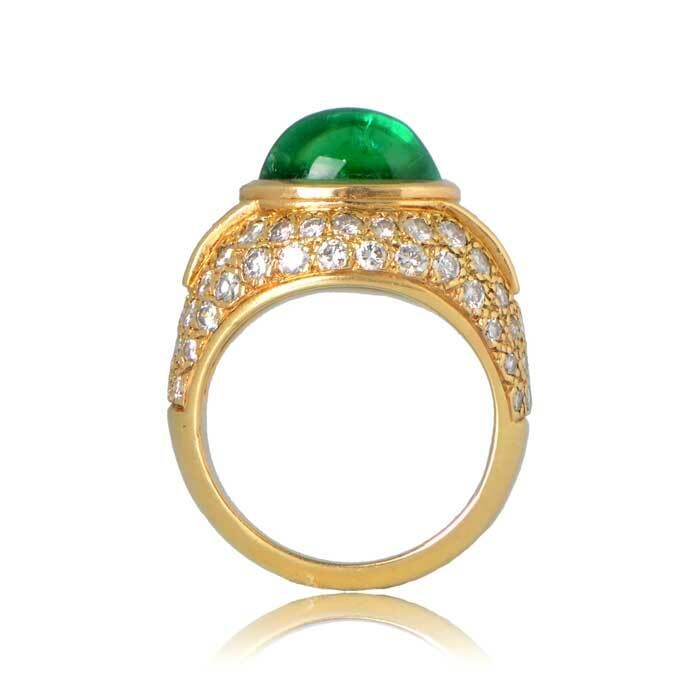 SKU: NYC102 Categories: Emerald Engagement Rings, Vintage Cocktail Rings - Contact us and request additional pictures. - Free overnight & insured shipping in the USA. - Includes courtesy ring sizing. - 14 day return policy, no questions asked. ☎ Call us at: (212) 265-3868. We offer free FedEx overnight shipping on all orders on our website throughout the US. All orders are insured for the full value of the package. FedEx requires that there is someone available to sign for the ring upon its arrival to the address that you provide. We strive to ship out all orders as soon as we receive payment. We do however require an additional 1-2 days if the ring needs sizing. We will contact you in advance and attach the FedEx tracking number so that you will know when to expect the package. All the rings, wedding bands and earrings on our website are covered by our 14 day return policy. You may return this item within two weeks from the time of delivery, in the same condition as it was received, for a full refund. If you have any questions about our return policy, feel free to contact us. Would you like to see more pictures of this ring? Add your name and email to this form. We will respond within 1 business hour. Click here to view all of our reviews. Would you like to see more pictures? Would you like to view these rings in person? Schedule an appointment at our New York showroom. Learn about Estate Diamond Jewelry. Connect with our helpful staff. 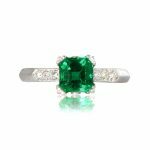 Join our mailing-list and keep up to date on the latest rare and fine rings to join our collection. 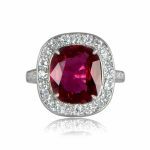 We provide free overnight and insured shipping for all the jewelry on this website! We also have a 14 day complete return policy, no questions asked.